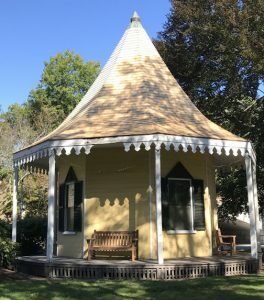 From September through May of each year the Society offers a season of programs and lectures that highlight the unique history of this community and its residents. 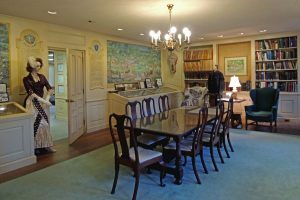 In addition to monthly events which are free and open to the public, members of the Society staff the Claflin Room in the Belmont Memorial Library where they maintain their archival collection of all things related to Belmont. The room is open to the public four days a week when volunteers are on hand to answer questions and to share their knowledge of the town from its agricultural beginnings to today’s modern suburb. During a visit there you can enjoy displays of interesting artifacts, browse through Belmont High School Yearbooks, purchase a variety of Belmont-themed products, check out recent additions to the collection, or do your own independent research! The Society also publishes a quarterly newsletter, provides an annual High School Scholarship, recognizes the preservation of historic buildings and open spaces, and actively encourages residents to apply to obtain a Historic House Plaque for qualifying homes. For more information on how you can become involved, please contact us at belmonthistory1859@nullgmail.com. Programs The 2018-2019 series of programs will begin this fall. Please check our Coming Events page for information about our future programs. In the meantime, you may watch on-demand streaming videos of many of our recent programs through the courtesy of the Belmont Media Center — the links are on the Recent Events page. Preservation Awards The Belmont Historical Society presents an award (the Belmont Historical Society David R. Johnson Preservation Award, named after a long-time member and officer of the Society) to individuals or organizations that have made a notable contribution to preserving structures or land in the town. Each year the Society invites community members to nominate projects or individuals for this award. 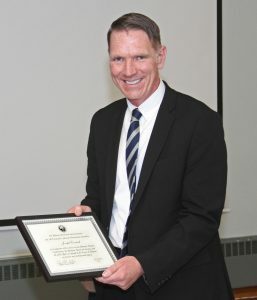 Five awards were made for 2018 at the Society’s annual meeting on May 16th. You may click here to see a list of previous recipients plus information about the range of activities eligible for the award. Nominations for the 2019 awards will be accepted beginning early in 2019. 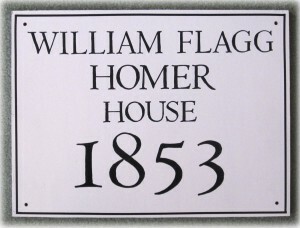 Sample of a Belmont Historic Plaque which can now be obtained for any qualifying house in Belmont. Historic House Plaque Program The Belmont Historical Society operates a Historic House Plaque Program that offers attractive exterior wooden plaques that can be used to identify historically interesting properties that are are least 50 years old. This program imposes no restrictions on the properties or special requirements on the homeowners. We are actively soliciting applications from property owners who would like to identify their properties as historically interesting and significant. Applications may be submitted at any time. Click here for further information about the program, a list of previous recipients, resources for tracing the history of your property, and the application form for a plaque. Newsletter The June 2018 issue of our quarterly newsletter was mailed to all members of the Society. 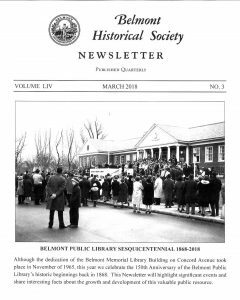 If you did not receive the latest latest issue (which is one of the benefits of Belmont Historical Society membership), you are invited to review the current and past issues in the Claflin Room (see sidebar). Of course, we always welcome new members and invite you to take an active role in the Society’s activities. To learn more and to download an application form, click on Membership. 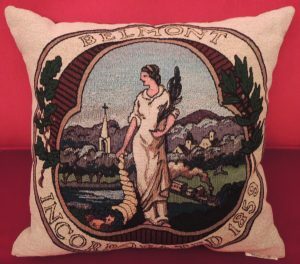 Belmont Pillow The Belmont Historical Society offers for sale a decorative pillow with the Belmont town seal. This pillow measures 18 inches by 18 inches and would fit nicely on a sofa or a chair. The figure on the town seal is Pomona, the Roman goddess of fruit trees, gardens, and orchards — a very appropriate symbol for Belmont which was a farming and market garden community throughout much of its history. The town officially adopted this seal in 1882. If you are interested in the pillow or a Belmont book, email us at BelmontHistory1859@nullgmail.com or call us at 617-993-2868. Elementary School Visit Each year second graders from the Roger Wellington School make their annual fall visit to the Claflin Room in the Belmont Memorial Library. That space serves as the headquarters of the Belmont Historical Society and is staffed by volunteers from the organization who are on hand to share the unique history of the town with the eager students, dedicated teachers, and parent chaperones. The field trip is coordinated to coincide with the unit the students are taught about early Belmont, and according to the teachers the students look forward to the visit to the Claflin Room as a chance to step outside the classroom and connect with local history firsthand. During the visit the group is treated to a fast-paced and fact-filled presentation that answers questions such as how did the town get its name? what is the oldest business? and who are some of the founding families? During the 45 minutes the children are encouraged to participate and are given time to view some of the interesting items from the Historical Society’s archival collection. This year’s visit took place on November 2nd. Click here to see some of the items that the students last year found particularly interesting, and click here to read some of the reports that they sent back after their visit. You may also click here to see an expanded description of the topics and items covered during these student visits in previous years. Restoration of Historic Wellington Station The photograph at the top of this web page shows the historic Wellington Station, originally built as a private school building in the 1840’s and then used as the Belmont station for the Fitchburg Railroad from 1852 until 1879. Today the Wellington Station is owned and maintained by the Belmont Historical Society and sits just outside the town center at the intersection of Concord Avenue and Common Street. In the fall of 2014 the Society submitted an application for 2015 Community Preservation Act (CPA) funding to replace the deteriorating wood shingle roof on this iconic Belmont landmark. On May 6, 2015 the Belmont Town Meeting members approved our request of $26,300 for this much-needed restoration work to be completed in 2017. In October 2016 the Society’s Board approved additional funding to cover the repair of the deteriorated wooden porch surrounding the station and painting the posts and exterior trim of the building. The major task of replacing the badly deteriorating roof has been completed, and you may see a slideshow of the work in progress. Final restoration and repair of the exterior trim will be completed during 2018. Click here to learn more about this important piece of Belmont history and the CPA process. NOTE: Our website is in transition and we will update it and add content as quickly as possible, so visit us again soon. If you have any questions about the Belmont Historical Society, email us at BelmontHistory1859@nullgmail.com. The Belmont Historical Society is an all-volunteer organization entrusted with preserving the history of Belmont for future generations. In order to achieve this goal we rely on your active participation. If you can make a commitment of as little as two hours you can make a big difference. Financial donations are also most appreciated and are tax deductible. Do you have old photographs, school yearbooks, bits of family history, scrapbooks, or souvenirs that you no longer need? Please consider entrusting them to our collection. The Historical Society maintains hundreds of ordinary items generously given by people like you that over time become quite unique. Ladies dresses from the 1800’s, play books and posters that reflect the social events of the early 1900’s, and many photographs, letters, diaries, and ledgers document life and lifestyles in this community from its incorporation to modern times.